Side Sleeper Pillow, Side Sleeper Pillows are pillows that should be designed to be more supportive than other pillows and typically higher to properly support your head and neck alleviating pressure on your shoulders. Sleeping on the wrong pillow can have negative effects on your sleep, causing you to toss and turn throughout the night in an effort to get comfortable, only to awake with neck and shoulder pain. This is why, if you are in fact a side sleeper, you need to be using the correct pillow. Unfortunately with so many pillows available online and in stores it can be very confusing. Keep in mind that pillow comfort is subjective, what may be right for one person may not be good for another. This is why reading pillow reviews may make your purchase decision more confusing and influence you in choosing a pillow that might not work for you personally. So forget about reading pillow reviews and apply some simple logic. There are many variables to consider when choosing a side sleeper pillow that will work best for you. Pillows should not be sold as if they were a commodity. One size “does not fit all” as some retailers may want you to believe. For them it is easier and more cost effective to stock one pillow that works for most, rather then three pillows that will work for everyone. Some variables to consider when determining what height and shape would work for you, are mattress density and shoulder width. For example if your mattress is on the firmer side, you will require a higher pillow than if on the soft side, on a softer mattress your shoulder will sink in more than on a firm mattress. When choosing a side sleeper pillow you should first know what height pillow will be the most supportive for you. It is recommended that you lay on your actual mattress as if you were in a standing position to determine the distance between the side of your head and the surface of your mattress, this distance is roughly how high your side sleeper pillow should be. This distance is usually between 3” to 5” for mosts adults. 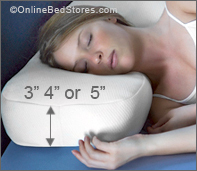 OnlineBedStores.com has found a side sleeper pillow that is available in three different heights 3”, 4” or 5”. This side sleeper pillow is made in the USA, features a patented proprietary shape specifically designed for side sleepers. This pillow will provide support and help to keep your head and neck in perfect alignment with your spine while sleeping on your side. Available in a 3”, 4” or 5” height.